For you California runners, the PA/USATF ultra series schedule has now been posted. It looks like Way Too Cool 50k is back on the agenda, and the Tahoe Rim Trail 100 is being added to replace the about-to-disappear Rio de Lago 100. Up to 7 of the 16 race results will count towards your score, per usual. Plenty of excuses to do lots of racing! Ask Swiss native Serge Roehteli what defines "long run" for him, and the answer will blow your mind. How about a five year run totally over 25,000 miles on six continents and through 37 countries? This epic round-the-globe adventure is exactly what Serge set out to do in February, 2000, with his wife, Nicole, as his sole support with a motorcycle towing a small trailer. A movie about their adventure is premiering this month, and will soon find it's way to DVD. I had a chance to interview Serge about the run, the movie, and what he learned about the world in the process. 1) Such an incredible journey! What motivated you to sell your worldly possessions and take off on a 25,000 mile run? To be free. To help kids in the suffering parts of the world. To have an amazing journey. We traveled with very few things: our Yamaha motorcycle-- which still works-- sleeping bag, camera, batteries, one coffee pot, pot to cook spaghetti, passport, toothbrush, camera, extra clothes, food that we bought at markets, gifts received from people we met a long the way, and a machete for cutting away shrubs. I also kept pictures of my children. We were completely free, but we also had to rely solely on ourselves. 2) Why run? Why not just travel? It was my dream and we chose to just do it. We wanted to bring attention to the suffering children around the world and running was the best way to do that. When you travel normal, you meet normal people. When you travel unique, you meet unique people. 3) What were the toughest stretches? Did you ever fear for your safety or health to the point of contemplating quitting? The toughest stretches were when it was hot and humid. All of Asia--Singapore, Thailand especially---West Africa, and some parts of the United States were very difficult. The deserts like the Sahara were very challenging. It was also very difficult to run when it was freezing cold. When it was really tough, like when we got Malaria, or when I thought I didn’t have the spirit, or thought I wasn’t good enough, I would think to myself- your life is hard, because it is a free choice. I chose to pay this price. I met thousands of people whose lives are so hard all of the time because they just to want to survive-- they are sick, poor, or they have no food-- when you realize that your life is good and you met so many people whose lives are so hard, you shut up and keep going. I was afraid of the political trouble around the world. I was afraid of Malaria, but I knew it could be treated. But, the worst animal on the planet is the human. Humans can be frantic when they believe too strong in one ideal that doesn’t allow them to be open minded. That happens especially with religion when people are sure they have the truth. We ran through the Middle East four days after Sept. 11 and that scared us. Everyone was scared and we were too. We were afraid in Guinea, also, because we got caught in war. We had to stay in the Swiss Embassy for four days while the war continued. Houses were burned, people killed, and women were raped. We were also afraid sometimes in the downtown areas of huge cities like Cape Town and Johannesburg in South Africa, because they are very dangerous. Sometimes we were afraid in the big cities of the United States as well, because a few times we stayed under a shelter or freeway. But, we knew this was the price of our dream to run around the world, so we continued on. I had many injuries along the way, including severe tendinitis. While we were in South Africa, I had to spend 28 days in bed to recover from it because the running was so hard on my legs. I also had trouble with my sciatic nerve, and while running through India, a car hit me and I broke a bone in my elbow. But, none of those injuries compared to Malaria. During the World Run, while running through Africa, Nicole and I both caught Malaria. It was bad for Nicole because she fell into a coma after she got a very bad fever. She had contracted one of the worst kinds of the disease. When I came down with it as well, I went to the doctor in Africa and he told Nicole that if they don’t give me a shot, I will die. Even after we caught Malaria, we did not quit. We knew we could succeed. 4) How many pairs of shoes did you go through? I went through 64 pairs of shoes during the World Run. I always had small injuries on my feet. 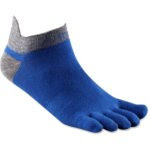 Including losing toe nails. The run also had a huge effect on my knees. They are very bad now. I have had three operations on them and one operation on my ankle. I have run more than 50,000 miles in my life and that is hard on them. During the World Tour I took care of my knees in three different ways- I slept nine to 10 hours a night, drank lots of water and tea, and kept stretching. 5) Do you think about running the same way after this journey than you did before you started? What does it mean to you now to just go out for a run? I realize day-after-day, month-after-month, year-after-year, that running around the world was one of the best things I have ever done in my life. It started as a dream in my heart. I remember when I was thinking about running the world or doing another challenge -- I considered climbing to the highest peak in the world as well-- but we chose to run the world. What a fantastic way to be free! When I take off for a run now, I begin to think I was crazy. Because now, when I see a picture or read a story about the run, I think “how did I do that”? You have to be crazy to imagine you can run the world. But, it’s better to be a crazy, happy man than a boring man. I don’t run as much as I used to, but if I could run on the moon, I would leave tonight. 6) I bet you got to meet a lot of locals in the 37 countries you visited. What surprised you the most? You find nice people all around the world. But, the country closest to my heart is Madagascar. I loved the people there. They are very poor, but they are very friendly. I also enjoyed meeting people in Laos and Nepal. The people in the U.S. are very nice as well. When I ran in the U.S., everyone had an open mind and everyone wants to know you and ask questions. 7) How did the two of you meet? Are you both runners? I met Nicole in a coffee shop 19 years ago. She was a waitress. Nicole does not like to run, except to stay in shape. 8) Serge, were you an ultrarunner before beginning this journey? What are some of your favorite ultras? Yes, I have always been a runner, boxer, biker, mountain climber. I believe all of those activities helped me prepare my body for the world run. My favorite is to run a mountain trail near my town. It connects six Swiss mountain cabins. When I run that trail, I feel free. I do it with just a small backpack on. Sometimes I am out running that trail for a day, three days or I will do it for a week straight. I did many runs before the World Run such as Death Valley, which was 100 miles, and the Grand Canyon. I ran Europe in the winter from Gibraltar to Norway, which was 4,375 miles; I ran from the southern tip of Argentina to Fairbanks, Ala. in what became known as the America’s Challenge, which was 15,000 miles; and I ran Italy to Milan, which was 1,100 miles. Running Death Valley was worse than running the Sahara during the World Run, because I wasn’t trained well enough. I spent three months in the Sahara and every day I felt better and better. Death Valley was one of my first major runs. I ran it – 100 miles- in four days and I was not prepared enough. Running the Sahara, I felt very mentally prepared. My America’s Challenge two years prior took me through Chile, Mexico, and Baja California, which prepared me for the conditions of the Sahara. I ran during the night from 2 a.m. to 10 a.m. and after we found a shadow to retreat in such as our tent, or a dirty old house. I drank water all the time; a minimum of two to four gallons a day. The Sahara is 2,000 miles and it took me three months running 30 miles every night. I just took it step by step. 9) Tell us a bit about the movie. 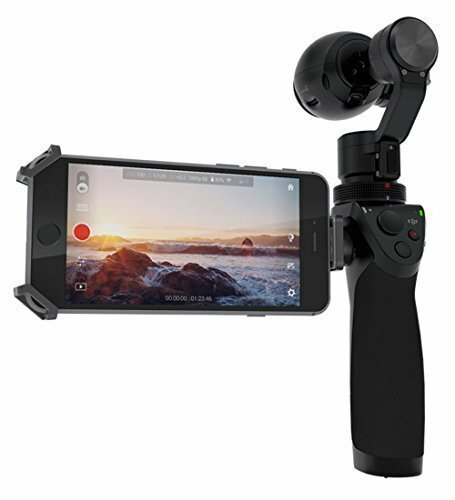 How much footage did you have? How long did it take to make the film? 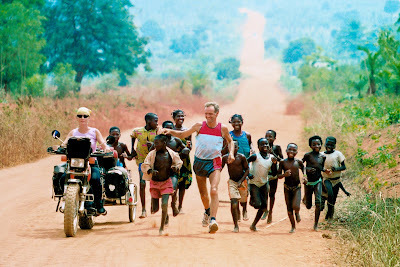 The movie is about the World Run. The footage was captured from our video camera that we kept to document the film. All in all, the run took us five years. I ran more than 25,000 miles, over six continents, and through 37 counties (see map). I believe the movie is inspiring for all runners who are trying to achieve a goal or for anyone facing a challenge. We had 80 hours of footage from the trip and shot another 10 hours to finish. It took two years to make the film. 10) What are you hoping people will get from it? I hope people feel inspired after watching the film. I believe it is hard to change the world, but we can try by doing small things. You build your life step-by-step, day-by-day. Don’t think about the big things; just try to do the small things one step at a time. Some advice I have for people who are going through a hard time or athlete trying to overcome a challenge is not to focus on the finish line. Just take it a little bit at a time and concentrate on that moment and what you are dealing with. I have said it before, but nothing is impossible as long as you are willing to pay the price for your dream. 10) Where will it debut first? How can we find out where it might be playing next? The official premier will be in New York City at the end of April. Before the official premier, we are having several private screenings that will take place in 13 major running communities across the U.S. including: Albany, N.Y.; San Antonio; Los Angeles; Boston; New York City; Washington D.C.; Minneapolis, Minn.; Indianapolis; Kansas City, Mo. ; Denver; Seattle; and Milwaukee. The rest of the screening dates are TBD. The movie will then play in select theaters across the U.S., then be available on DVD, and then move to T.V.. There is also a book coming out about Nicole’s Diary, which she kept during our journey around the world. The film is narrated with excerpts from it. You can find out all movie information including the dates of the private movie screenings, theaters and DVD release on the movie blog at, www.beyondtheepicrunblog.com. Elite marathoner (and now ultramarathoner) Josh Cox used the 2009 Rock n Roll Arizona Marathon as a starting point to set a new USA Track & Field record for 50 kilometers with an official time of 2:47:17. He bettered the previous road 50K record by over four minutes set in 2002 by Alex Tilson of Palo Alto, CA. "My legs felt fine, but I was having a hard time keeping fluids down," said Cox, who leading up to the race had his sights set on the world best 2:42:10. "It was tough out there, but the crowd support really helped, especially once I got going around the track. I was training such that even though it was an off day, I still got the American record." Cox overcame two bathroom breaks and an upset stomach, which plagued him over the first 20 miles of the race. His marathon split of 2:20:32 was his best time in the last two years and good for ninth place overall. His final lap on the track was clocked at 71 seconds. "Marathon is still my sport and 2012 is my goal," added Cox, referring to the Olympic Games in London. "But like when running 50 miles helped my performance in college track, these types of efforts will hopefully help my marathon running. I'd love to come back again and try to lower my time." Jorge Pacheco of Los Angeles and Kami Semick of Bend, Oregon have been voted the 2008 UltraRunning Magazine North American ultra marathoners of the year. Pacheco edged Kyle Skaggs of Glenwood, New Mexico by three votes, 185-182, in the closest vote in the award’s 28-year history. Pacheco won six of the eight races he competed in during the year, including the 135-mile Badwater Ultra across Death Valley in July and the Rocky Raccoon 100-Mile run in Huntsville, Texas in February. Semick won five races during 2008, and placed second in the IAU 100km World Championships in Italy. She was the winner of two of North America’s most competitive events, the Miwok 100km race and The North Face Challenge 50 Mile, both in northern California. Badwater and Umstead 100 Mile winner Jamie Donaldson of Littleton, Colorado polled a close second, with Eugene, Oregon’s Susannah Beck third. Kyle Skaggs’ stunning course record run at the Hardrock 100 Mile in Silverton, Colorado was voted the men’s outstanding performance of the year. Semick’s 7:33:58 at the IAU World Championship was voted the outstanding women’s performance. In age group awards, a world age-group record of 133.19 miles in 24 hours set by 60-year-old Roy Pirrung of Kohler, Wisconsin at the IAU World Challenge in Seoul, Korea was honored as the top male performance. Voters had more difficulty choosing which of Diana Fitzpatrick’s runs was the most impressive. Fitzpatrick, 50, of Larkspur, California, won top honors for her 7:30:42 at the American River 50 Mile, with her 19:51:43 at the Vermont 100 placing second. A board of 20 voters from all regions of North America submitted ballots this year. Also receiving votes: Erik Skaggs, OR, 18; Andy Jones-Wilkins, ID, 17; Nate McDowell, NM, 17; Byron Lane, NY, 10; Eric Grossman, VA, 10; Geoff Roes, AK, 8; Jon Olsen, CA, 8; Dave Mackey, CO, 7; Keith Knipling, DC, 7; Josh Brimhall, NV, 6; Jasper Halekas, CA, 5; Scott Jaime, CO, 5; Joe Ziegenfuss, MN, 5; Matt Carpenter, CO, 4; Karl Meltzer, UT, 3; Sean Andrish, VA, 2; Brian Kistner, SC, 2; Steve Stowers, CA, 2; Graham Cooper, CA, 2. Also receiving votes: Justine Morrison, DC, 28; Jenny Capel, NV, 22; Christine Crawford, WI, 21; Laurie McGrath, ON, 17; Michelle Barton, CA, 12; Krissy Moehl, OR, 9; Meghan Arbogast, OR, 8; Anita Ortiz, CO, 7; Helen Cospolich, CO, 6; Betsy Nye, CA, 4; Ronda Sundermeier, OR, 3; Jenn Shelton, OR, 2. Also receiving votes: Matt Carpenter's The North Face Challenge 50 Mile, 16; Hal Koerner's Angeles Crest 100 Mile, 9; Michael Wardian's Caumsett 50 km, 8; Jorge Pacheco's Leona Divide 50 Mile, 6; Anton Krupicka's American River 50 Mile, 4; Eric Grossman's Tussey Mountainback 50 Mile, 3; Duncan Callahan's Leadville 100 Mile, 2; Jorge Pacheco's Badwater 135 Mile, 1; Michael Wardian's White River 50 Mile, 1. Also receiving votes: Jamie Donaldson's Umstead 100 Mile, 17; Anne Riddle Lundblad's Bull Run Run 50 Mile, 13; Jennifer Pharr-Davis’ Appalachian Trail record, 9; Meghan Arbogast's IAU World Championship 100 km, 7; Connie Gardner's JFK 50 Mile, 4; Nikki Kimball's Tahoe Rim Trail 100 Mile, 3; Anita Ortiz’ San Juan Solstice 50 Mile, 3; Connie Gardner's Burning River 100 Mile, 3; Kami Semick's Miwok 100 km, 2; Suzanna Bon's Quad Dipsea 28.4 Mile, 2; Suzanna Bon’s Cascade Crest 100 Mile, 2; Jenn Shelton's American River 50 Mile, 2. Also receiving votes: Rick Miller, 61, Wasatch 100 Mile, 13; Richard Webb, 51, IAU World Championship 100km, 12; Mike Tselentis, 82, Quad Dipsea 28.4 Mile, 8; Wally Hesseltine, 65, Angeles Crest 100 Mile, 5; Bill Dodson, 73, Helen Klein 50 Mile, 5; Karsten Solheim, 71, Vermont 100 Mile, 5; Tony Mauro, 65, Rocky Raccoon 100 Mile, 4; Richard Hillestad, 65, Avalon 50 Mile, 4; Ralph Hirt, 70, Javelina 100 Mile, 3; Frank Probst, 65, JFK 50 Mile, 3; Tom Bunk, 66, Ice Age 50 Mile, 3; Roy Pirrung, 59, Mad City 100 km, 3; Leo Lightner, 79, JFK 50 Mile, 3; Michael Kanning, 16, Jed Smith 50 Mile, 3; Nick Bassett, 63, Heartland 100 Mile, 3; Ed Ayres, 67, Helen Klein 50 km, 2; Eric Clifton, 50, Noble Canyon 33 Mile, 2; Dennis Mowbray, 61, Quad Dipsea 28.4 Mile, 1; Don Landry, 61, Self-Transcendence 10-day, 1. Also receiving votes: Nancy March, 60, Leona Divide 50 Mile, (1) 16; Juliane Scheberies, 74, Ruth Anderson 50 km, 16; Emma Riconda, 51, Caumsett 50 km, 14; Lorraine Bunk, 67, Ice Age 50 Mile, 13; Suprabha Beckjord, 51, Self-Transcendence 3100 Mile, 9; Nancy March, 60, Way Too Cool 50 km, 8; Betty Frankum, 68, Orange Curtain 50 km, 6; Barbara Isom, 61, Mountain Masochist 50 Mile, 4; Eldrith Gosney, 67, Skyline 50 km, 3; Ruth Liebowitz, 66, Caumsett 50 km, 2; Barbara Elia, 63, American River 50 Mile, 2; Hwa Ja Andrade, 67, American River 50 Mile, 1. Have you ever wondered what the Western States Board of Trustees does? After receiving the notification of the cancellation of the 2008 race, I felt like thanking whomever was looking out for us and realized I didn't know who they were. So I tracked down John Trent, a Trustee of the Board, to do an interview and learn a bit more. John Trent experienced his first Western States 100-mile Endurance Run in 1987, shortly after graduation from the Reynolds School of Journalism at the University of Nevada, Reno. An avid runner already, he was sent to Western States to cover a race his sports editor described to him as “some crazy race.” Trent fell in love with the race immediately, and vowed to one day run it himself. In 1997, he ran the first of what would become eight Western State finishes. His first finish was notable for its time – 24:01, which left him a little more than a minute short of earning a coveted silver belt buckle for a sub-24-hour finish. In 2000, he ran the first of seven consecutive sub-24’s at Western States. 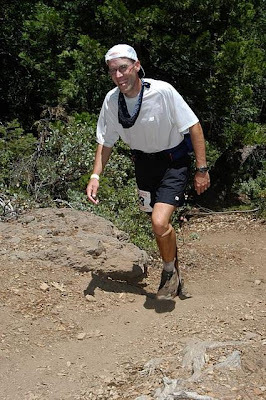 His fastest time at Western States came in 2002, when he finished in 20th place overall in a time of 20:15. Trent became a member of the board of trustees at Western States in 2004, where he focuses on communications and serves as the race’s media relations coordinator. During a 10-year career as a sportswriter at the Reno Gazette-Journal in Reno, Nev., Trent was a two-time winner of the Nevada Sportswriter of the Year award. He also worked as deputy press secretary and speechwriter for former Nevada Gov. Kenny Guinn, and is currently the senior editor for news and features at the University of Nevada, Reno. Since undergoing microfracture knee surgery in 2007 following an injury at the 2007 Miwok 100K (a race where he still managed to finish in 18th place after tearing cartilage in his left knee at Miwok’s 15-mile mark), Trent has yet to return to ultramarathoning. Even without active competitive participation, his involvement with Western States remains one of the most important priorities in his life, following his duties as a husband to his wife, Jill, and father to daughters Annie, 19, and Katie, 16 (all three of whom have served as his crew at Western States in years past). 1. Could you tell us a bit about the WS Board of Trustees? What is their charter and how often do they meet? The Western States Endurance Run’s Board of Trustees is comprised of 13 members. We are a not-for-profit organization charged with all aspects surrounding the Western States 100-mile Endurance Run, from organizing each year’s run to fulfilling trail maintenance projects throughout the year to enhancing the historic and cultural significance of the Western States Trail to fostering a medical research agenda that will help science better understand the physical demands of the race to working with the various local, state, regional and national management entities in a shared effort to ensure that the trail remains open to the public. Our roots go back to 1977, when the first board of directors of the Western States Endurance Run was formed as part of the Western States Trail Foundation. The original group was made up primarily of a handful of runners and horse riders (remember that Western States originally was held in conjunction with the Tevis Cup 100-mile horse race) who had helped monitor the progress of the 14 runners who had run the first official Western States 100-miler earlier that summer. By 1978, the race had mushroomed to 21 aid stations, six medical checks and hundreds of volunteers, and it became more apparent than ever that a board of trustees was needed to manage this massive growth. More than 30 years later, four of the unsung heroes of the race’s history are Phil Gardner, Mo Livermore, Shannon Weil and Curt Sproul. They were the individuals who pushed for an independent event, separate from the Tevis Cup and really set in motion what nearly 400 runners experience each year. Shannon and Mo remain members of the board today. Both Shannon and Mo, in a very real sense, continue to represent the rich history, and moral compass that any modern endurance event needs in order to be successful. 2. Who is on the board and what are their roles? Do you have to have a finisher buckle to be eligible to be on the board? We have a 13-person board. Our officers are Tim Twietmeyer, president; Shannon Weil, vice president; Kathy Hamilton, secretary; Dr. Gary Towle, M.D., treasurer. It’s a very eclectic group, and we have a tendency to work in aspects of the areas that play to our strengths and expertise, both professionally and personally. One quick example. Mark Falcone is in charge of our trail maintenance projects. Anyone who knows “Marko” will tell you that he is an incredibly organized person who has a great knack for bringing together groups for the betterment of all. Under his guidance, the condition and overall health of the trail has improved dramatically over the past five years. Just take last year as an example. Marko and his trail crews cleared more than 450 trees from Robinson Flat to the finish line, and cleared an additional 200 trees from Red Star Ridge to Duncan Canyon in the course’s “High Country.” More than 4,300 red fir seedlings were planted on June 1 in the Duncan Canyon and Red Star Ridge area that had been hit so hard earlier this decade by the huge Star Fire. Marko would tell you, in typical fashion, that it’s all about the selfless volunteers and great partners, but it’s his vision, his enthusiasm, his know-how and expertise in bringing people together for a common cause, that really make all the difference in this effort. I would be remiss if I didn’t also mention that our president, Tim Twietmeyer, has also played an instrumental role in Marko’s efforts. Not only is Tim a five-time Western States champion, he has been there every step of the way for board members like Marko who have special talents, and who see the trail in special ways. Western States also has the services of the best race director in the land, Greg Soderlund. I’ve known Greg for more than a decade now, and I can’t think of a more responsible and reasoned person than Greg. No one cares more about the welfare of the runners at Western States than Greg. His attention to detail is simply amazing, and I’m always inspired by his patience, and his endurance. You should see him a week or two after the race. That’s when you can tell the toll the race takes on him. Multiply running 100 miles by about 400 runners. That’s how Greg looks when the barn door has finally been closed and everyone has safely made it to Auburn. And no, you don’t have to be a Western States finisher to be on the Western States board. It is important, though, that you have a great deal of passion about the race, as well as a willingness to work hard. In May and June, when the race draws nearer, it can easily become a fulltime endeavor. 3. Is it common for a race to have a board of trustees? If not, why does WS have one? It depends on the race. For Western States, a board of trustees is a must, simply because the trail traverses numerous local, state, regional and federal management entities and jurisdictions, which can sometimes create complicated layers of bureaucracy. A single race director, no matter how skilled, would have great difficulty handling all that is involved when you consider the sheer number of stakeholder groups who are located on or near the Western States Trail. Again, it is the expertise of some of the people on the board that really helps. We have the good fortune of having individuals such as Tony Rossmann on our board. Tony is a professor at University of California, Berkeley Boalt Hall School of Law and is considered one of the finest environmental law attorneys in the country. If not for his efforts in working with key legislators on the state level in California and on the federal level in Washington, D.C., in the mid-1980s through today, I don’t know if the trail would be as completely accessible to the public as it is. These are things that we just take for granted as trail runners; yet, for trail to remain open, we have to have people working behind the scenes on our behalf. Tony has played a major role in almost every instance where the federal government has bestowed special status on the trail. The most recent came in April 2008 when California U.S. Sens. Barbara Boxer and Dianne Feinstein introduced Senate Bill 2909, the Western States Trail Study Act, which represents the initial effort by Congress that can lead to designation of the Western States Trail as a National Historic and Scenic Trail – the highest level of federal recognition and protection that the federal government can give a trail. These are milestones that have Tony’s very capable and thoughtful fingerprints all over them. His work on behalf of the race – simply because he loves the race and what it represents – is just one example of the benefit of a board of trustees. 4. Can you give us some examples of decisions/outcomes of the board and how it affects the race? The events that led to the cancellation of last year’s race is probably the best example. During several group phone calls in the days leading to the cancellation, the board did everything in its power not to reach our final decision to cancel the race. We fully realized the commitment our runners had made, the months of training they had undergone, and we looked at every possible alternative to still hold the race. 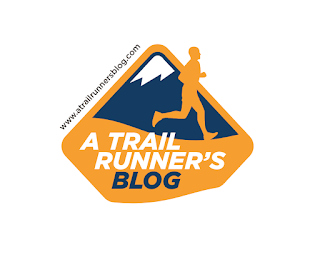 Although some of the alternatives seemed feasible for a while, ultimately each one led us to the same conclusion: No matter what the plan was, it still seemed to put the health and safety of our runners at too great a risk. We all realize that running 100 miles over difficult terrain, sometimes through infernal heat, is a risk for runners. But then to knowingly compound that risk by adding air that was deemed as some of the most unhealthful in the history of the region by air quality experts, seemed to be too over the top. Given that fact, we were all in complete agreement that the most prudent course of action was to cancel the race. It was a precedent-making decision, one that obviously disappointed a number of runners throughout the country and the world. On the other hand, on a personal level, do I feel that the board acted wisely, and in the best long-term interest of our runners? Is it a decision I still support? Absolutely. The other example of decisions/outcomes by the board that sticks with me was the disqualification of Brian Morrison in 2006. That was a difficult decision. I’ve been involved or have covered Western States as a journalist for more than 21 years, and I don’t think there has been a more courageous run than Brian’s run in 2006. Conditions were brutal on that day and he literally ran himself to exhaustion. By the time he reached the track, he was so exhausted his mind had detached itself from his body. He didn’t knowingly break the race’s performance rules, although it was clear that he had, as a few other well-intended individuals helped him across the finish line. Brian has said he doesn’t have any recollection of the events on the track – and for good reason, he was utterly, absolutely exhausted at that point. As we gathered as a board to decide on what to do, we all felt an incredible amount of sadness and empathy for Brian. He had with great courage run his heart out. But the race’s performance rules were clear. Brian’s sense of sportsmanship in the wake of his disqualification was something that I will always remember. There are a number of truly wonderful people who have run Western States over the years, but I find it hard to think of anyone who has shown the type of graciousness and nobility and spirit that Brian has shown over the past couple of years. He’s a truly remarkable person – and he’s on the entrant list for 2009. As I’ve said many times to our fellow board members, rooting against Brian at this point is a little bit like rooting against Seabiscuit – no one with a heart ever should, nor should they ever count him out. 5. You’ve been involved with Western States over a decade, and officially on the board for the last five years. How did you get involved? What have been some of the bigger challenges since you have been a part of it? In 1987, I had just graduated from Reynolds School of Journalism at the University of Nevada, Reno, and I was hoping to catch on as a fulltime sportswriter at my hometown paper, the Reno Gazette-Journal. The sports editor at the time, Mike Blackwell, knew I was a runner and asked me if I’d be interested in driving over to Auburn to cover “this crazy 100-mile race where they run from Squaw Valley.” I was desperate to impress him – and also intrigued by the race. I had seen it covered on ABC’s “Wide World of Sports” before. It was a day of unrelenting heat, one of the hottest Western States on record. The steady Herb Tanzer caught Steve Warshawer to win. I was just so struck by the beauty of the trail that day, plus the friendliness of the volunteers and the spirit of the athletes. I covered the race for several years after that as a sportswriter for the Reno Gazette-Journal (I got my fulltime job there eventually), and really lost my mind about the race when I paced a good friend, Joe Braninburg of Reno, in the ’95 race. I ran the final 38 miles with Joe for a story I was writing, and you couldn’t have asked for a more interesting day. It had all the elements of a great story: Joe was gunning for the 50 to 59 age group title, it was another year of great ice (snow for the first 30 miles of the course) and fire (temperatures of 107 degrees during the day), plus the Tarahumara Indians were running that year. Several of them were busy battling the legendary Ann Trason that day and Tim Twietmeyer was well on his way to cementing his legend at Western States with yet another difficult win. What has stayed with me since that day are the bells that the Tarahumaras wore on their sandals. A couple of the Tarahumaras chased my friend Joe through the night, and it was exciting to race the haunting sound of those bells through all the canyons, up Robie Point and onto the track at Placer High. I’ll always remember how Joe shifted into high gear when he saw the lights of Placer High. Another great older runner, Ruth Anne Bortz, who ran an amazing 24:34 at age 56 in 1986 might’ve said it best: When you step foot on that track for the first time for the finish, it’s like you’ve died and gone to heaven. Joe ran a remarkable race for a 51-year-old; he finished in the top 10 that day, and I had a story that I was immensely proud of afterward. I could barely walk for three or four days afterward. It was my longest run ever to that point. It ensured that I was hooked, and that I would try the race myself. I’ve since finished the race eight times, seven under 24 hours, with my best time of 20:15, good for 20th place, in 2002. My area of expertise for the board is in communications. I’ve been a writer all my life, and in addition to being a sportswriter, I teach journalism at the college level and have served as a speechwriter and deputy press secretary for former Nevada Gov. Kenny Guinn. My role is to handle a number of communications related issues for the race. Probably my biggest challenge to date occurred on the evening of June 25, 2008, when I had about 40 minutes to draft the race’s statement that the race was in fact being cancelled. It kind of reminded me of a moment that the documentary filmmaker Ken Burns related when he was finishing up “The Civil War.” Burns said that it took him a long time to actually emotionally prepare for the moment in the film when Abraham Lincoln was assassinated. “The longer we waited in the editing room, the more it seemed like we were delaying the inevitability of a painfully dreadful moment,” Burns has said in an interview. In might sound like a stretch, but I felt the same way. Before I could actually write the words that the race was being cancelled, I had to get up from my computer at home, take a deep breath and compose myself, because I knew once the message was completed, there was no turning back. 6. How does the board view the increased popularity of ultrarunning? In general, I think we are happy that the sport continues to grow, and that it has continued to attract the young and the young at heart. The growth of ultrarunning has certainly presented numerous challenges for our board, in terms of making sure that there is a sense of fairness and transparency in what we do in selecting a field for the race. No selection process is perfect, and I think that is why you see that as more ultras are looking at limiting the number of participants, they each use a slightly different method. Not every race is the same, nor should they try to be. That’s why you see a race like “Way Too Cool” taking a first-come, first-served approach while ours and others have chosen over the years to use a lottery system. The upside to this great growth is that there are so many possibilities out there. If you can’t get into Western States there are a number of great ultras out there to choose from. Variety is extremely important, and since I underwent microfracture knee surgery about 18 months ago and my 100-mile days might be behind me now, I sort of wish I had tried Leadville or Wasatch or even Badwater. That’s what we tend to lose sight of as ultrarunners; there are plenty of great races to choose from, and we should constantly challenge ourselves to experience new races in new locales. 7. Is there anything that Western States participants can do to assist the board in their planning and decision making? We value feedback from all of our runners, and the ultra community in general. The only way a run can hope to improve is to seriously invite feedback from its core constituency, its runners. The lottery has always been a hot-button topic for the ultra community, which is, I think, great. In an interesting and meaningful way, it shows that there are a lot of people out there who really care about our race. We’ve received a number of exceptionally creative suggestions from runners from throughout the country and the world, and we truly do appreciate the fact that often that type of feedback is detailed down to the spread sheet level. Mine is pretty bad (I had just thrown up about a half mile earlier on the climb from Swinging Bridge), but now that you know what we all look like, feel free to share your thoughts with us. Any and all emails, phone calls, letters or comments in the middle of a 50-miler somewhere are always appreciated. Scott, thanks for the opportunity to share some thoughts about Western States. From the members of the Western States board to you, we sincerely look forward to watching your finishing lap at Placer High this June. I'm looking forward to it as well! Thanks for taking the time, John. I hope your recovery is coming along nicely. 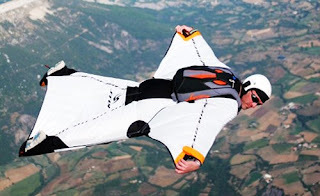 Just when I thought us ultrarunners were the craziest, Marco Denson sends me this link about Norwegian wingsuit basejumpers who "got bored" and decided to fly 100+ mph within a few feet of huge cliffs. DANG. The USATF recently amended their rule that banned headphones for all races. It is now up to the Race Directors, with the exception of Championship races where they will remain banned. INDIANAPOLIS - USA Track Field has amended Rule 144.3, which pertains to the use of headphones and other electronic devices, to enable race directors to choose to allow the use of headphones by runners in non-championship races. 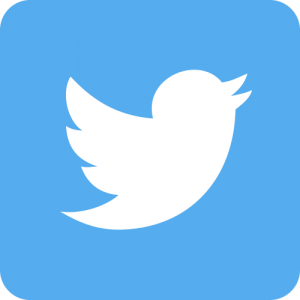 "(f) The visible possession or use by athletes of video, audio, or communications devices in the competition area. The Games Committee for an LDR event may allow the use of portable listening devices not capable of receiving communication; however, those competing in Championships for awards, medals, or prize money may not use such devices." The rule previously had banned the use of headphones by all runners. While headphones remain banned for any athlete competing in a USA Championship, they may be allowed by race directors in other circumstances, at the discretion of each race director. Enforcement of the previous ban was in the hands of race directors, with some enforcing the ban, some simply urging runners not to use headphones and others not enforcing it. Rooted in a concern for athlete and volunteer safety, the rule had drawn passionate feedback from all sides, including from runners who hated the rule and runners who loved it; from volunteers who had seen the logistical difficulties of having participants wearing headphones; and from race directors who supported it and others who had had encountered logistical difficulties enforcing it. "The difficulty in enforcement was part of the reasoning," USATF Rules Committee chair John Blackburn said. "However, several good-sized races have demonstrated that they were able to enforce the rule. There were strong opinions on all sides of this discussion, both understanding the issues related to athlete safety, race organization, difficulty of enforcement. This resolution appeared to be the best position for USATF overall." USA Track Field (USATF) is the National Governing Body for track and field, long-distance running and race walking in the United States. 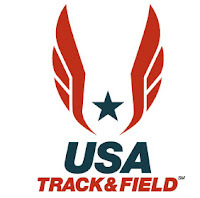 USATF encompasses the world's oldest organized sports, some of the most-watched events of Olympic broadcasts, the #1 high school and junior high school participatory sport and more than 30 million adult runners in the United States.